The first film to be released under the FrightFest Presents label, the new venture from leading independent distributor Signature Entertainment and leading genre festival FrightFest, THE DARK received its UK premiere at this year’s prestigious FrightFest in London, and is perfect for genre fans who love nothing more than a backwoods shocker featuring ghouls, gore and flesh eating, but one done with panache and poignancy. The feature debut of writer/director Justin P Lange (expanded from his 2013 short film), THE DARK features an outstanding performance from rising star Nadia Alexander as Mina - a ghoulish creature, her face a mess of rotting wounds, she still manages to evoke sympathy, despite her penchant for swinging axes and tearing out throats. Also appearing is acclaimed Austrian actor Karl Markovics (The Counterfeiters), as the nervy, murderous criminal Josef, who appears in the incredibly taut and eerie opening twenty minutes, seeking sanctuary in the woods. With brilliant sound and production design (Mina’s backwoods home makes the house in THE TEXAS CHAIN SAW MASSACRE look positively palatial), shocking bursts of bloody violence, THE DARK is an unnervingly original chiller, that simultaneously pulls at the heartstrings and makes the skin crawl. Admirers of recent rustic indie horror gems like I AM NOT A SERIAL KILLER and PYEWACKET will eat it up. An undead young woman, Mina, stalks the ‘Devil’s Den’ woods where she was killed. If anyone enters the woods, she kills them and feasts on the body. But when she stumbles upon a young blind boy named Alex in the back of a car, who shows signs of horrifying abuse, she can’t bring herself to kill him. As police and locals close in, searching for Alex, Mina’s growing relationship with him changes her in ways she never thought possible. 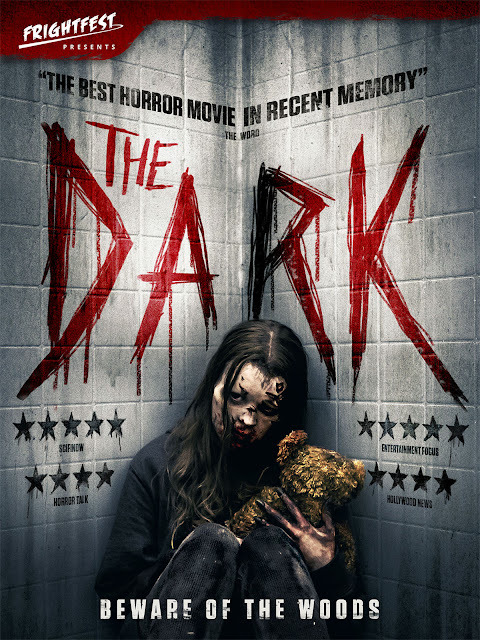 THE DARK is released on DVD and Digital HD 22nd October 2018.